Josh gained a wealth of experience over the winter in Australia and continued to make good progress in 2015 riding in all three Leagues for Birmingham, Wolverhampton and Sheffield. He surrendered his U21 British crown, being pipped at the post by Kyle Howarth who ironically is his new Tigers team mate. Josh joins another of his Tigers team mates, Jason Garrity doubling up with Elite League Coventry in 2016. For the Tigers he starts in the no.4 race jacket with the personal target of adding another 2 points to his average. Josh regained his U21 British title on his home track in April ahead of Robert Lambert and Adam Ellis, and then scored 12 at Pocking (Germany) to qualify for the World U21 final, but then dislocated his collarbone in the home meeting against Glasgow. He fnished 6th at he U21 final first leg at King's Lynn but then was thrown from his machine when the tapes caught his helmet in the Redcar match leaving him suffering from concussion. Dmitri is the 20 year-old son of former rider Philippe Berge. He is already a multiple World Champion having won the 2009 125cc Grass track, and the 2012 250cc Longtrack titles. He also finished on the rostrum in the 250cc Speedway final that same year. Having qualified for the 2014 World Longtrack Grand Prix he than suffered internal injuries riding for Glasgow against Peterborough. After a lengthy spell out of action he then crashed in a Longtrack Grand Prix practice breaking his arm and ending his season. Dmitri returned for the Glasgow Tigers in 2015 until a dip in form saw him ask to be released due to a "loss of confidence". He soon regained it and saw the season out riding for Redcar. When the 'Bears' visited Owlerton in August he defeated Brady Kurtz on his way to a paid eight point score. Dmitri has taken a liking to the Owlerton circuit and has formed a striking partnership with skipper Simon. With confidence soaring he is carrying his form away with him too. Dmitri won the rain shortened World U21 qualifier at Belle Vue riding unbeaten and setting a new track record in the process. Jason was British U15 Champion in 2008 before joining the Buxton Hitmen in 2009. He was British U19 Champion and National League Riders Champion in 2011 while riding for the Belle Vue Colts and the Leicester Lions. He rode the Rye House Rockets for the next three years and represented them at the PLRC in 2014 scoring 6 points. Unable to find a Premier League berth in 2015 Jason was concentrating on his Elite League commitments for Coventry until being invited to join the Tigers as cover for the injured David Bellego. The move to Owlerton obviously suited Jason who seemed to enjoy riding for us almost as much as the fans appreciated his never-say-die style. Jason has made a steady if unspectacular start to 2016 but was improving his average until taking a heavy tumble riding for Coventry against Lakeside in May. He missed the away win at Scunthorpe but bounced back in style top scoring both home and away against the Workington 'Comets'. Jason saved the day at home against Newcastle in June and his 15 point maximum saw his 2016 average eclipsing Simon Stead! Then a fall in the British final injured his arm, and he aggravated it while guesting at Leicester the following weekend which probably cost us an away win at Redcar. Maximums: Full: 2 Home. Paid: 1 Home. Chesterfield based Nathan started riding motorbikes at a very early age. He entered the 250cc U16 British Championship in 2010 and won the final round at Plymouth to finish 2nd overall. He went one better becoming U16 Champion in 2011, and then won both 250 and 500cc Championships in 2012. Concentrating on just the 500cc he successfully defended his title in 2013. He was the youngest fast-track rider in 2014 when he joined Elite League Swindon while winning medals for the National Shield, League, K.O. Cup and the Fours with Cradley. Back with Cradley in 2015, but now at Perry Barr, he also signed for Premier League Workington and was going well until breaking his leg at Derwent Park in the match against Rye House. Quick starting Nathan has found himself lacking power around the spacious Owlerton track but continues to improve and is well received by the Owlerton faithful. He wrote himself into the record books by winning the first ever official race at the new Belle Vue National Speedway Centre. Richard joined the Prowlers from Newcastle in 2002 and was soon drafted into the Tigers squad as cover for the injured Ben Wilson. He started 2004 at reserve but finished the injury ravaged season in the no.3 jacket. He had a good solid season as second-string in 2005 and was challenging Ricky Ashworth for the third heat-leader berth, but this made him a victim of the average trap and there was no place for him in there Tigers 2006 squad. Stepping up into the Elite League he earned a winners medal with the Peterborough Panthers, but was released from their 2007 side and then days later broke his pelvis and foot competing in the Garry Stead Grand Prix. Back into the Premier League in 2008 with Scunthorpe and a good season saw him being recalled to the Tigers in 2009. He put half a point on his average but again finished the season injured. In 2010 he shaded Josef Franc for the third heat leader slot and once again had to look further field. He started 2011 as the skipper of the Leicester Lions but was released when his Longtrack commitments caused him to miss too many meetings, and he finished back at Scunthorpe covering for the injured Viktor Bergstrom. He captained the Tigers in 2012 but failed to improve his average with poor away form. A dislocated shoulder sustained at Berwick in 2013 seemed not to affect his Longtrack results while at the same time his speedway form dipped lower and lower and he eventually relinquished his team place to André Compton. 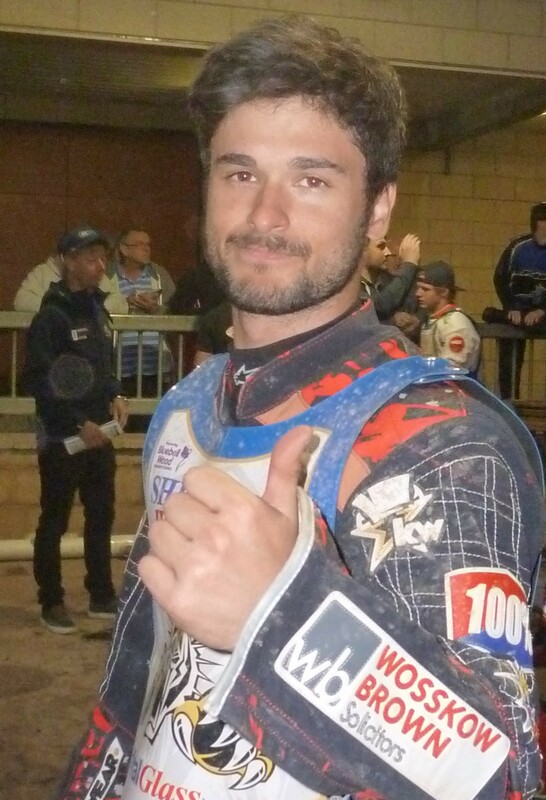 Richard started the 2014 season with Redcar but received a 30 day ban and lost his team place before finishing the season back at Peterborough. Berwick offered Richard a team place in May 2015 but it was the Longtracks which held his interest. He led the GB team to our first ever Longtrack World Team Cup victory in June and finished second in the German Grand Prix in September, but finished the speedway season as a Bandits reserve, hence his lowly starting position for the 2016 Tigers. Richard struggled to find form, especially away from home (with the exception of Scunthorpe) he was released in favour of a revitalized Arthur Sissis. Twenty four hours later Richard shocked everyone by defeating Josh Bates in the British Semi-final run-off at Scunthorpe to qualify for the British Final at Belle Vue. Included in his scalps was that of Chris Harris! Kyle was an accomplished grasstrack and motocross competitor before turning his attention to amateur speedway in 2008. On his debut for the Scunthorpe Saints in 2009 he scored 13+2 and he finished runner up in the British Under-15 championship. Signing for Poole Pirates in 2010 he rode for Bournemouth Buccaneers in the National League, guested for the Somerset Rebels in the Premier and took third place in the British Under-18 Championship. All change in 2011 as he joined Belle Vue in the National League, and Edinburgh Monarchs in the Premier. After a winter riding in Australia where he won the Queensland Under-21 Championship he joined Poole Pirates in the Elite League and Workington Comets in the Premier League in 2012. Swindon and Workington have been his clubs for the last couple of seasons but it is all change for 2016 as he has joined the Elite League Wolverhampton Wolves and the Tigers in the Premier. Kyle's last visit to Owlerton was with the Comets last August when, riding as No.1 he only managed four third places, but surely the reason for his selection was for his previous experience on circuits where the Tigers have a very poor record. Let's hope the home fans get behind him and give him time to get to grips with his new home circuit. After some disappointing recent results Arthur has decided it's time to try his luck back in speedway racing and a long time association with Neil Machin resulted in him joining the Tigers for 2015. After a steady if unspectacular start to the season Arthur showed his mettle in the challenge match against Cradley when he raced to his first ever maximum. In his best performance of the season Arthur raced to paid 14 at Berwick and set up a last heat decider. Tommy Jorgensen fell in front of Arthur who had nowhere else to go and he collected a separated collar bone which ended his season. After a lengthy recuperation Arthur returned to replace the struggling Richard Hall. Question marks concerning his fitness after nearly 8 months out of the saddle were laid to rest when he raced to victory in his first race against the Glasgow Tigers. Simon joined Workington for the 2003 season doubling up with Wolverhampton in the Elite. He won the Premier Pairs title with Carl Stonehewer and made it a hat-trick of British U21 wins. Stepping up to the Elite League he joining Belle Vue in 2005, won the Elite Pairs with Jason Crump in 2006 and was given a wildcard at the British Grand Prix. By 2007 he had progressed to heat-leader and was loaned to Coventry for 2008. In 2009 he transferred to Swindon where he enjoyed a testimonial meeting in 2012 and helped the Robins to their first ever Championship win beating the Poole Pirates in the play-off final. Simon, now a full Sheffield asset and doubling up with Belle Vue in 2015, started the season in fantastic form and led the Tigers to wins in all six opening fixtures including a rare away win at Rye House. Unfortunately in the last heat of that meeting at Hoddesden he clipped the fence while leading heat 15, somersaulted back into the path of his team mate and suffered a broken femur and upper arm. Simon suffered concussion after a fall in the Ben Fund meeting and missed the clashes against Leicester at the start of the season. Paid maximums at Peterborough, and home against Glasgow were followed with a top of the podium finish in the fantastic cut and thrust British semi-final at Scunthorpe. Maximums: Paid: 1 Home, 1 Away.